Highflyer Sire Line Quick Chart. See-Saw's metier was a mile, and despite getting a few horses that won at classic distances -- including an Irish Derby winner and two winners of the Grand Prix de Paris -- most of his offspring, like him, were milers or sprinters, stout, precocious juveniles, and good weight-carriers. He got enough of them, racing for smaller purses, to place third one year in the sires list in Great Britain. While he had a couple of sons that continued the sire line for a few more generations, it was several of his daughters and grandaughters that had an enormous impact on thoroughbred bloodstock, in England, and to a lesser extent in New Zealand, the United States, and Germany. See-Saw's sire, Buccaneer (1857), was bred in Hampshire, at the Greywell Hill estate of the 3rd Baron Dorchester. Buccaneer was a son of Epsom Derby winner Wild Dayrell and a mare by Little Red Rover, the latter the dam of the infamous Cruiser. The Little Red Rover mare produced a number of low-level winners, almost all, regardless of the stallions to which she was bred, fast horses that could not go beyond a mile. Even though Wild Dayrell mostly got stayers, Buccaneer inherited the the non-staying speed of his dam, and, racing for the 5th Earl of Portsmouth, won most often at a mile, taking eleven of his nineteen starts between ages two and five. Buccaneer was Wild Dayrell's most successful sire son: he got two classic winners -- Formosa and Brigantine -- and See-Saw during his three years at stud in England, and Epsom Derby winner Kisbér, later a leading sire in Germany, and Flibustier, a successful stallion that continued the sire line in Germany, during his long, successful tenure at the Kisbér Imperial Stud in Hungary. See-Saw's dam, Margery Daw (1856), by Brocket, was described as "common and coarse." Her sire, Brocket, was a modest stallion whose best runner was Palmerston (1867, from Rita by The Flying Dutchman), a winner of Newmarket's Claret Stakes and second to Kingcraft in the 1870 Epsom Derby. Margery Daw, after producing a dead filly in 1864, was purchased in foal to Buccaneer from her breeder, B. Way, by Richard Bell. The next year she dropped See-Saw, and was bred to Dundee, producing Dunbar (1866), a winner of Ascot's St. James's Palace Stakes at age three. Her next foal was Cradle (1867, by Saunterer), a winner, whose Hermit daughter, Fleada (1872) was tail-female ancestress of the bulk of Family 6 - f.
Margery Daw and Cradle were then purchased by William Blenkiron for his broodmare band at Middle Park Stud. There Margery Daw produced Crinon (1868, by Newminster) and Ecossasis (1871, by Blair Athol). Crinon never raced, and when Blenkiron died in 1872, she and her dam accounted for part of the 15,000 guineas laid out by Bell -- who had become the general manager for the newly-formed Cobham Stud Company -- at the Middle Park Stud dispersal sale (Blair Athol was also purchased for Cobham at the sale for a stunning 12,500 guineas). Margery Daw would go on to produce several other foals at Cobham, including Macaroon (1874, by Macaroni), a winner and second in the Cesarewitch, and Berceaunette (1877, by Blair Athol), a filly that bred on for a few generations. At Cobham, Crinon bred Landscape (1873, by Blair Athol), who was sold to South Africa, where her tail-female line did very well, with three South African Derby winners up to 1953; The Rover, a useless runner with bad feet that was probably the sire of St. Gatien (winner of the Cesarewitch Stakes and a shared winner of the Epsom Derby); and two other daughters with descendants that won in South America. In 1879 Crinon was sold, in foal to Blair Athol, for 700 guineas to Baron Maltzahn, and went to the Pound Stud, near Ripley; in 1885 she was bred to Robert the Devil and sold to France, where she dropped Criniere (1886), a winner of a number of races in France, including the Prix de Diane and the Prix la Rochette. Margery Daw's son Ecossasis (1871), bred at Middle Park Stud, and purchased by Bell for the Cobham Stud as a yearling for 550 guineas -- the highest price paid for any Middle Park yearling at the dispersal -- was sold to the French sportsman C.J. Lefèvre, who in 1871, with a stable full of both English and French-bred horses winning in England, was close to the top of the leading owners in Great Britain. Ecossasis was a high-class juvenile winner of Ascot's New Stakes, Newmarket's July Stakes, and Newmarket's Chesterfield Stakes, and at age seven of Ascot's All-Aged Stakes (6 furlongs). See-Saw was a brown colt; almost all turf commentators noted his good legs and feet and "coarse hocks." He was "very straight in front, and a bad goer in his slow paces, but possessed of magnificent quarters which gave him enormous propelling power," despite the condition of his hocks. See-Saw was purchased by the Marquis of Hastings and placed in training with John Day at Danebury; while a good enough runner as a juvenile, he was considered part of the Marquis' second string -- horses such as Lecturer (1863, then a four year old and winner that year -- 1867 --of the Ascot Gold Cup and the previous year of the Cesarewitch), The Earl (1865, Doncaster's Gimcrack Stakes and later the Grand Prix de Paris and St. James's Palace Stakes), and Lady Elizabeth (Ascot's New Stakes and Newmarket's July Stakes) were considered much better. At age two he won five of his thirteen starts, including the Champagne Stakes (five furlongs) and a sweepstakes for juveniles over four furlongs (by ten lengths) at Stockbridge; the Cranbury Park Stakes for juveniles at Southampton (beating two horses by twenty lengths), and the Sussex Stakes (5 furlongs) at Lewes. His most impressive races that year, because of the quality of the competition, were Ascot's Queen's Stand Plate -- beaten by a head by Cecrops, with the future quadruple classic winner Formosa (by Buccaneer), nowhere, and seven others in the field -- and the Ascot Biennial, where he was second to Tregeagle (by Wild Dayrell), beating Bismark and three others. In December of 1867 the sporting world was surprised by the announced sale of the Marquis' horses at Stockbridge, although at the sale Hastings bought in several of the best, including Lecturer, The Earl and Lady Elizabeth. Tattersall brought the hammer down on See-Saw for £2500, a good sum, paid by Thomas Egerton (born Thomas Grosvenor), (2nd) Earl of Wilton, the younger brother of Richard Grosvenor (Marquess of Westminster). Wilton had been an excellent amateur horseman in his younger years, and had even won a race on his father's famous horse, Touchstone, at Heaton Park (near Manchester), the Egerton seat, where he established the Heaton Park racecourse in 1827. See-Saw would remain in Wilton's ownership until the earl's death in 1882. See-Saw was placed in training with Tom Wadlow, at Stanton, near Shifnal in Shropshire; he was known for his patience in both training and placing horses in races. At age three See-Saw did not place in the Epsom Derby or the Doncaster St. Leger. He did, however, win the Ascot Biennial (beating the French horse Nelusko), the Stockbridge Biennial (beating Parson and Nelusko), the Newmarket Derby, the 1-1/2 mile Newmarket October Handicap (beating the French-bred filly Nemea and nine others, including Vespasian, winner of Newmarket's Trial Stakes, York's Zetland Stakes and other races that year), and the Cambridgeshire Stakes Handicap at Newmarket Houghton. In the latter, held in the rain and near-dark, the favorites were beaten early, and the race came down to a brief duel between Epsom Derby winner Blue Gown and See-Saw, after which See-Saw engaged his powerful hindquarters and surged ahead in the last thirty yards to win by a length. Both horses were giving away weight to the twenty other horses in the race, which included that year's Cesarewitch winner Cecil, Restitution (who would win the Goodwood Cup the next year), Lady Coventry, and a number of other past or future winners of good races. A turf writer later said, "If the whole Veterinary College had made to order a Cambridgeshire horse, they could not have improved in any way upon See Saw...he was as fit as hands could make him, and suited to the distance, and framed to get up the Cambridgeshire Hill, of which he thought nothing." At age four, in 1869, See-Saw ran five times, and won twice. Carrying 8 st.-12 lbs. in the Cheshire Stakes at Chester, with no other horse carrying more than 7 st., he failed to place; At Epsom, again heavily weighted, he could not place in the Watton Manor Stakes (1-1/4 miles). Then, at Ascot, he won the Royal Hunt Cup over one mile, carrying 8 st.-7 lbs. In the Chesterfield Handicap at Goodwood, won by Vespasian, The Palmer and See-Saw, both giving away weight to the rest of the field, came in fourth and fifth, with nineteen in the field. Finally, at Lichfield in September he won the Anglesey Plate (3/4 of a mile), carrying 9 st.-10 lbs. in a canter, beating four others. See-Saw had shown that like his sire, he was an excellent miler, and that he could win at a mile-and-a-half against moderate horses. In the stud, See-Saw was generously supported by Wilton's best broodmares, but he saw few outside mares and had small crops. He began his career at Weston Park, Weston-under-Lizard, near Shifnal, in Shropshire, near the stables of his trainer, Tom Wadlow. Wilton's racing stable was managed by Col. Henry Townsend Forester, an enthusiastic sportsman, nephew of the Duke of Rutland and brother-in-law of the Earl of Bradford, whose seat was as Weston Park. In 1874 he was moved to Barrow's Paddocks at Newmarket, where he stood at 15 guineas, next to King o' Scots (25 guineas) and the Newminster son, Cathedral (50 guineas), and the next year he was leased to Lord Scarborough and stood at his Tickhill Stud. In 1876 he was leased to the Cobham Stud, probably due to his connection with Bell, but he was competing with several other stallions and it does not appear his book was large; he stood at 25 guineas that year, with Caterer at 40 guineas, and his close relative Wild Oats (by Wild Dayrell) also at 25 guineas. In 1878 Hume Webster established a modern breeding stud at Marden Deer Park, near Caterham in Surrey, and leased See-Saw from Wilton, who was 79 years old and would die four years later. By then, See-Saw had made his reputation as a stallion; "nearly everything by him can race," said one turf writer, but it wasn't until 1876 that his youngsters placed him on the sires list (based on earnings), in the seventeenth spot. After that, he would barely make the top twenty each year, until 1881, when his first Marden Park crop hit age three; that year he was third on the sires list, behind Hermit and Leamington. In 1883 he was sixth, tenth in 1884, and eighteenth in 1885, also due to his Marden Park youngsters. After Wilton's death in 1882, he was sold and went to George Hastings-Bostock's Iwerne Minster Stud in Dorset, where he stood, starting in 1883, at a fee of 50 guineas until, in 1885, suffering from "acute inflammation," he was shot. He was ninth on the list in 1887, the last time he appeared on the chart. See-Saw got SORTIE (1879, from Relief, by Julius), a winner of the Irish Derby, and LITTLE DUCK (1881, from Light Drum by Rataplan), imported into France in-utero, winner of the Prix du Jockey Club (beating Archiduc and other good ones) and the Grand Prix de Paris. In England, the closest any of his offspring got to winning a classic was BRUCE (1879, from Carine, by Stockwell). BRUCE was unbeaten at age two, winning Ascot's Windsor Castle Stakes (beating eight other juveniles), Egham's King John Stakes (beating six other youngsters), Doncaster's Rous Plate (3/4 of a mile, beating six), and Newmarket's Criterium Stakes (beating seven). He went into the Epsom Derby the next year as first favorite, but, due to jockey error, where he was allowed to swing way too wide at Tattenham corner, while the moderate filly Shotover, masterfully ridden, took the shortest route and gained a great deal of ground, he was second, becoming one of the Derby's famous "should have won" horses. Taken to France, he won the Grand Prix de Paris the year before LITTLE DUCK. The back-to-back wins in the Grand Prix de Paris by See-Saw sons made him popular in France, and in 1885 BRUCE was also imported there to stand at stud. In France, BRUCE'S best winner was Wandora (1887, from Windfall by Favonius), winner of Poule d'Essai des Pouliches and the Prix de Diane, among other races. He also got Sledge (1887, from Skating by Cremorne), a winner of the Prix Boiard; Chapeau Chinois (1890, from Clarinette by Plutus), who won the Prix du Nabob (2500 meters) at age three; and Reine des Fleurs (1898, from Illusion by Zut), a winner in England of the All-Aged Stakes. Wandora was later a superior broodmare in France. She produced Vinicius (1900 by Masque), a winner of the Grand Criterium at age two, and the Poule d'Essai des Poulains and the Grosser Preis von Baden at age three, and Val d'Or (1902, by Flying Fox), who also won the Grand Criterium and the Poule d'Essai des Poulains, and also at age three the Prix Monarque and the Eclipse Stakes in England. BRUCE was also dam's sire of Sesara (1896, by Donovan), a winner of the Poule d'Essai des Pouliches and the Prix Vermeille at age three; Flying Star (1903, by Flying Fox), who took the Prix de Diane; the brilliant and ill-fated Grand Criterium winner Holocauste (1896, by Le Sancy), and Prix du Jockey Club winner Gardefeu (1895, by Cambyse), later sire of two classic winners in France and of Chouberski (1902), the sire of Brûleur. LITTLE DUCK, who was almost 17 hands high and, unlike most See-Saws, quite comfortable at classic distances, sent the sire line forward in France through his Prix du Jockey Club winning son, Champaubert (1893, from Tantrip by Carnival). Champaubert won the Prix du Jockey Club, the Prix Royal Oak, and the Prix Daru at age three, and other races at ages four and five, including the Prix d'Ispahan two years in succession. Champaubert got Friant (1909), a Prix du Jockey Club winner, and the filly Brienne, winner of the Prix Hocquart and Prix Vermeille at age three. Friant was the end of this branch of the sire line in France. Champaubert was also dam's sire of the wonderful staying mare, La Francaise (1907, by Simonian), winner of the 4200 meter Prix du Cadran, and of the 5,000 meter Prix Rainbow and Deauville's 3,000 meter Prix Kergorlary twice each. LITTLE DUCK was also the sire of Perdican (1889) winner of the Grosser Preis von Baden and the Prix Biennal (3200 meters) at Longchamp; of Canvas Back (1894), winner of the 2500 meter Prix Hocquart; Arlequin (1893), who took the two mile Ascot Stakes in England at age three; Gosbeck (1896), winner of the Fürstenberg Rennen and the Grosser Preis von Baden; and Ibidem (1903), who won the Preis der Diana. Through Ibidem he was dam's sire of Ariel (1911), a winner of the Deutches Derby; another daughter, Biella, produced Mademoiselle Bon (1906, by Simonian), a winner of the Grosser Preis Von Baden, and her brother, De Viris (1909), who won the Poule d'Essai des Poulains and the Prix du President de la Republique (Grand Prix Saint-Cloud), among other races. A thin line also continued tail-male through See-Saw's speedy son LOVED ONE (1883, from Pilgrimage by The Palmer), who got the Irish-bred Dinna Forget (1892, from Barometer by Chippendale), winner of Kempton Park's 1-1/2 mile Jubilee Handicap and the 1 mile-2 furlong Liverpool Summer Cup. Dinna Forget sired the Irish stallion Dinneford (1902, from Gracie by Arbitrator), who was yet another brilliant Royal Hunt Cup winner in the family, and also won Newmarket's July Cup (6 furlongs), Newmarket's Princess of Wales's Stakes (12 furlongs) and the Liverpool Summer Cup (1 mile-2 furlongs). Dinneford was the effective end of the tail-male line in the British Isles. LOVED ONE was bred and raced by the Dutchess of Montrose. He had a modest career on the turf, winning Newmarket's Cheveley Park Stakes (beating Phoebus) and Newmarket's HomeBred Post Foal Stakes (beating Mephisto), and was second by a length to Mephisto in the Boscawan Stakes, in four starts as a juvenile, and at age three, in five starts, he won Ascot's 6 furlong Wokingham Stakes (beating eighteen), the only time he placed that season. He was disposed of at auction at Newmarket, purchased by Captain Machell for 400 guineas, and sent as a stallion to William Alexander, who lived in Co. Sligo, Ireland, where he served hunter and harness mares for "a few guineas...sent to him not because of his beautiful breeding, for they had probably never heard of Pilgrimage, but because he was a thoroughbred, and thoroughbred stallions were rare in Sligo in those days." According to one turf correspondent, he "got some topping good hunters, because I owned one once, and she was a 'nailer!" He covered the mare Barometer, owned by Capt. Peel, "quite by accident." Dinna Forget (1892) was the result, and in Ireland he won the Leopardstown Prize (5 furlongs), worth £885 at age three. Dinna Forget was sold to A.F. Basset, and won four races in England for him the following year, and then was sold to Reid Walker for whom he won the Jubilee Handicap and Liverpool Summer Cup in 1898. He was by far LOVED ONE's best runner, and his only son to make the sires list, standing ninth in 1906, thanks to Dinneford. In the fall of 1896, after Alexander's death and Dinna Forget's big win at Leopardstown, LOVED ONE was purchased by the Doncaster horse dealer, Andrew Brown for about 1,000 guineas, and taken back to England, where he was sold to Henry Waring, owner of the Beenham Stud, near Reading, "an establishment at which the modern principle of 'mass production' was applied to thoroughbreds...Waring...seemed always to prefer quantity to quality." This occasionally paid off, since, in addition to LOVED ONE's two famous daughters, Gondolette and Doris, the excellent broodmare Concussion -- dam of Dabchick, the unbeaten Irish juvenile Sirenia (dam and grandam of classic winners), the terrific racemare Hammerkop (dam of Derby winner Spion Kop), and Llangibby -- was also bred at Beenham. Waring typically sold the Beenham yearlings at Ascot. LOVED ONE'S first Engish-bred stock raced in 1900, when he was age seventeen; he had three winners of four races, including daughter Doris (1898, from Lauretta by Petrarch), who won the Worksop Plate at Leicester and a juvenile selling plate at Epsom in nine starts. His best year was 1904, when he had seven winners of fourteen races, worth £3,637. In the end, he was the sire of thirty-three winners of 92 races worth £20,734. He was destroyed in 1908 at age twenty-five. Obviously, LOVED ONE was an extemely modest stallion, although his opportunity to be anything else was severely limited, but his daughters proved good producers: Vic, Happy Thought, and other daughters bred winners of more than 100 races; this included Sabrina, the dam of Yorkshire Oaks winner Mademoiselle Foch (1916, by Sunder). Most importantly, he had a significant impact on throughbred bloodstock as a broodmare sire through two mares that became powerhouses in the stud book: Gondolette (1902, from Dongola by Doncaster) and Doris , neither of which, as racehorses, rose above selling class. Gondolette bred two classic winners, Ferry (1915), winner of the One Thousand Guineas, and Epsom Derby winner Sansovino (1921), later a successful sire and broodmare sire, and several other good runners. Doris produced four high-class racehorses, including the dual classic winners Princess Dorrie (1911, One Thousand Guineas, Epsom Oaks), and Sunstar (1908, Two Thousand Guineas, Epsom Derby), and the brilliant top-class juvenile, White Star (1909). 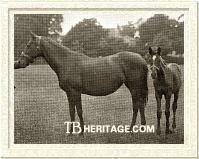 The sons and daughters of these two mares had a great influence on thoroughbred bloodlines in the 20th century. See-Saw's son DISCORD (1876, Anthem by Cathedral), won Newmarket's Craven Stakes (one mile), Newmarket July's Midsummer Stakes (one mile), and at the Liverpool meetings the St. George Stakes (1 mile-5 furlongs, beating six), the Knowsley Dinner Stakes (1-1/4 miles, beating 2), and the Duchy Cup (1-1/2 miles, beating two). DISCORD (1876), described as "a big, powerful horse" stood at Tickhill, Rotherham, and continued the family tradition by getting Quarrel (1891, from Free and Easy by Hilarious), a winner of the Royal Hunt Cup in 1896. DISCORD'S daughter, Disruption bred the stayers Roughside (1893, by Hagioscope), winner of the Newmarket October Handicap and the 2-1/2 mile Chester Cup, and Outbreak (1902, by Le Var), who won Newcastle's two mile Northumberland Plate. His daughter Golden Fringe (Half-bred Family B23) produced the 1-1/2 mile Manchester Handicap winner Golden Drop (1889, by Tertius) and Golden Leaf, a winner of many hunter prizes. With the exception of SORTIE, DISCORD, BRUCE and LITTLE DUCK, few of See-Saw's flat runners won over any distance beyond a mile. He got many winners of short races, but few offered large purses, which kept his standings in the sires list relatively low. 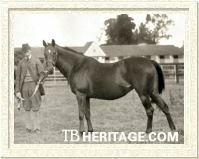 A high percentage of his youngsters were stout, long-running horses with many starts every season. See-Saw's best runners included Wilton's home-bred CRADLE (1873, Honeymoon by Rataplan) a long-running winner of numerous races, including Ascot's Royal Hunt Cup at age four, Newmarket's Houghton Handicap and the Drayton Highweight Handicap at age six, and Newmarket's Trial Stakes (one mile), Ascot's Trial Stakes (one mile), and Liverpool's Sefton Plate (seven furlongs) at age eight. His brother, CYLINDER (1877) won the Cambridgeshire Trial Handicap at Kempton Park, beating ten (1-1/4 miles) and some other, shorter races. Other good See-Saw winners included: FOOTSTEP (1873, Sandal by Stockwell), who took Ascot's Coronation Stakes (eight furlongs), the Liverpool Autumn Cup (one mile-2 furlongs), and the one mile Lincolnshire Handicap; JAPONICA (1876, Jeanette by Gladiator), winner of Goodwood's Rous Stakes and Brighton's Singleton Stakes (one mile) at age three; MASTER WALLER (1877, Mrs. Waller by King Tom) won the Bushes at Newmarket Craven (one mile), Epsom's Prince of Wales's Stakes (one mile), and Ascot's Visitor's Plate, and his speedy sister MISS WALLER (1881), winner of the Curragh's Flying Stakes and the Stewards' Plate at Baldoyle (Ireland); APPLE BLOSSOM [INCHCAPE] (1879, The Inch by Blair Athol), who ran 21 times as a two-year-old for R.S. Evans, winning nine juvenile plates at distances up to six furlongs; ACROSTIC (1880, Lady Alice Hawthorn by Newminster), another winner of the Royal Hunt Cup at Ascot and his sister, LADY LUMLEY (1875), winner of the Stanley Stakes and Fern Hill Stakes; DOG ROSE (1883, Hedge Rose by Neptunus), another speedster who took Goodwood's six furlong Stewards' Cup and the Sussex Stewards' Cup at age three; UPSET (1883, Fair Vestal by Vespasian), who also won Goodwood's Stewards' Cup; and DAZZLE (1884, from an Adventurer mare) a winner of thirty-five races during a long career. Many others won numerous selling plates and stakes in venues ranging from Newmarket and Goodwood to Carlisle and Huntingdon. DESPAIR (1879, from Peine de Coeur by Friponnier) had a not untypical career for a See-Saw colt in that he ran for a number of years, revisiting the same venues and same races, and retired sound. He was born at Church Farm Stud, near Ilsley in Berkshire, out of a modest race mare that won a few races for her purchaser, W.G. Stevens. As a juvenile he won three of his five starts -- the British Dominion Stakes at Sandown (4-1/2 furlongs, beat twelve others), and the Great Witley Stakes (beating two) and the Coventry Stakes (5 furlongs, beating three) at Worcester -- and placed second in Lewes' Astley Stakes and Derby's Champion Breeders' Stakes. At age three, DESPAIR failed to win any of his races, beaten into fourth in the Lincolnshire Handicap, where he could not stay the distance; unplaced in Sandown's Esher Stakes; third to Sweetbread in Ascot's Royal Hunt Cup, and failing to place in Goodwood's Lennox Stakes and Newmarket's Cambridgeshire Stakes handicap. The next year he hit the board three times, placing third, for a second time, in the Royal Hunt Cup, and going on in the next two days to win the All-Aged Stakes (6 furlongs) and the Wokingham Stakes (6 furlongs). At age five he won the De Warrenne Handicap at Lewes, placed second in Kempton Park's July Handicap, giving away 18 pounds, and second by a neck to Prism in the Leicestershire Cup, giving Prism 7 pounds, second in Derby's Hartington Plate, and second in Derby's Chatsworth Plate, carrying 9 st.-12 lbs. At age six he ran eleven times, but the best he could do was place second to Dalmeny in Goodwood's Stewards' Cup, with sixteen others behind him. He was back in 1886, age seven, and could not place in the Lincolshire Handicap, the Leicestershire Spring Handicap (finishing eighth), or Kemptom Park's Stewards' Cup. Then came Ascot's Royal Hunt Cup, and this time he won by half-a-length (beating thirteen), after starting at 25 to 1. His other win that year was the All-Aged Plate (five furlongs) at Epsom. He ran again in 1887, age eight, but failed to place, and was finally retired to his owner's stud, where he was born. As a stallion DESPAIR got some winners, almost all of them milers and sprinters, and made tenth on the sires list in both 1895 and 1897, due largely to his offspring noted here. His son Bentworth (1892, from Scampavia by Strathconan) won Doncaster's Gimcrack Stakes as a juvenile. Hopbine (1892, from Vixen), won races at age two, and at age three took the Whitsuntide Plate at Manchester, and the Hurstbourne Park Stakes at Stockbridge. Teufel (1893, from Cootie by Robert the Devil) won the Staffordshire Breeders Foal Plate at Wolverhampton and two months later won the still-prestigious Imperial Produce Stakes at Kempton Park, beating St. Frusquin. His best son was probably the in-bred Comfrey (1894, from St. Frida by CYLINDER), winner of the 1897 Cambridgeshire. See-Saw's son OCEAN WAVE (1883, from Par Excellence by Stockwell), a stallion at trainer Tom Cannon's Danebury stables, tended to get stayers, including his daughter Billow (1888), winner of the Ascot Stakes (two miles) at age four for Eustace Loder (later dam of Goodwood Cup winner Saltpetre (1900, by St. Simon)), and Crestfallen (1894), who took the Liverpool Spring Cup (and three days later the Liverpool Hurdle Handicap), but he also got Leopold de Rothschild's Trident (1896), a good juvenile speedster that could only run third in the Two Thousand Guineas, well-beaten by Flying Fox and Caiman. He also got Curzon (1892, HB Family 3), a winner of the Great Surrey Foal Stakes and eleven other races, and second to Sir Visto in the 1895 Epsom Derby. OCEAN WAVE was also dam's sire of the 1905 Preis der Diana winner Waldkatze. Another See-Saw son, DOG ROSE, was dam's sire of Yorkshire Oaks winner Catnap (1903) and Shake Down (1911), a winner of the Cheveley Park Stakes as a juvenile. Quite a few of See-Saw's offspring moved on to compete over fences, and did pretty well, no doubt assisted by the powerful hindquarters so many of them inherited. MERRY MAIDEN (1882, from Lizzie Greystock) won five of eleven races over fences at age six, including the Birmingham Grand Annual Steeplechase over three miles. The gelded CASTANET (from Parthenope) won the Grand Stand Plate at Cork Park over three miles by twenty lengths, and other races in Ireland. In 1888 See-Saw had eight winners of thirteen races over jumps, at distances of two and three miles. In France, his son LITTLE DUCK got Canard (1901), a winner of the Grand Steeple-Chase de Paris, and LITTLE DUCK'S son, Champaubert was the sire of Grosse Mere (1903), a winner of that race in 1907. Many See-Saw daughters bred on, and are seen tail-female in the pedigrees of stakes winners. Most of his more immediately successful broodmare daughters, many of them milers at best, ended up producing winning stayers when crossed with staying sires. These included WHIRLPOOL (1881, Miss Pool by Parmesan), the dam of Burnaby (1887, by Hagioscope), who won the 1892 Cesarewitch Stakes (2 miles-2 furlongs) and of The Rush (1892, by Barcaldine), who took the Liverpool Autumn Cup, the two mile Chester Cup, and the two mile Ascot Gold Vase; LADY LUMLEY (1875, sister to ACROSTIC), dam of the 1-1/2 mile Manchester Cup winner Lily of Lumley (1886, by Thurio), established a tail-female line successful throughout the 20th century; BRAN BREAD (1883, a winner over fences at age five), the dam of 1897 Goodwood Stakes (2 miles) winner Gluten (1893, by Thurio); BRAMBLE (1874, from Sylva by Young Melbourne), dam of Doncaster Cup (2-1/2 miles) and Great Yorkshire Stakes (1 mile-6 furlongs) winner Chesterfield ; SWALLOW (1877, from a Young Melbourne mare), who produced Goldseeker (1885, by The Miser), winner of the City and Suburban (1-1/2 miles); Avonwick (1875, from Avondale by Ratan), the dam of Great Yorkshire Stakes winner Bard of Avon (1890, by Exile) and of Stourhead (1881, by Altyre), who won the Goodwood Stakes and Manchester November Handicap. See-Saw's daughter JAPONICA (1876, from Jeanette by Gladiator) was sold to France where she bred Ravioli (1891, by Atlantic), who won the Prix Monarque and Prix du Nabob (2500 meters) and Puchero (1887, by Perplexe), who took the Prix de l'Empereur (2100 meters). The only See-Saw daughters to produce high-class sprinter/milers were STERLING LOVE (1883, from True Love by Sterling), who bred two winners of Ascot's 5 furlong New Stakes (Wedding Bell and Kissing Cup, both by Hampton), and ZIL ZELLAH (1878, from Donzella by Young Melbourne), the dam of the speedster Tostig (1887, by Edward the Confessor), winner of the five furlong Portland Handicap and Ascot's 8 furlong Trial Stakes. STERLING LOVE's tail-female descendants included two Grand National Steeplechase winners, Rhyme n' Reason (1979) and Hallo Dandy (1974), 1964 Epsom Oaks winner Homeward Bound, and other good winners. See-Saw's brilliant daughter MAZURKA (1878), bred by Henry Savile, was a fast filly that at age three took Ascot's Coronation Stakes (eight furlongs), beating six, Goodwood's Stewards' Cup (six furlongs), beating twenty seven others, and Liverpool's Croxteth Cup (5 furlongs), beating seven. She became a broodmare at Sir J. Blundell Maple's Childwick Stud Farm, near St. Albans, where the stallion Common held sway. She bred some minor winners, including Polka (1886, by Galopin) and Common Dance (1895, by Common), and Cinderella (1888, by Hermit), the latter purchased to the U.S., where she produced the Commando son Peter Pan (1904), and Fairy Slipper (1894, by St. Serf), whose tail-female descendants included Questionnaire (1927), Mata Hari (1931), and Spy Song (1943). 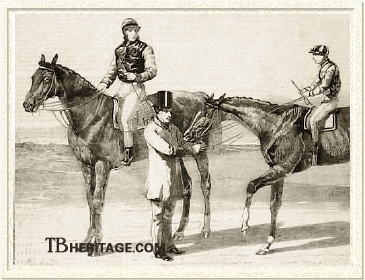 MAZURKA'S daughter Polka bred Rous Stakes winner Court Ball (1891), Royal Hunt Cup winner Csardas (1899, by Ladas), and La Danseuse (1907, by Ladas), whose tail-female descendants included Belmont Stakes winner Quadrangle, and the stakes winners and sires Kris (1976) and Diesis (1980). RECIPROCITY (1873, from Wild Cherry by Surplice) went into Tom Wadlow's stud, where she was bred to Wisdom, producing two daughters, Fair Profit (1881) and Fair Rent (1884) that bred on in tail female; the dual Irish classic winner Captive Princess, later second dam of the dual English classic winner Exhibitionist (1924, by Tredennis), and, more recently, the Deutches Derby winning half-brothers Orofino (1978) and Ordos (1980) descended from this female line. See-Saw's daughter BEAUHARNAIS (1874, Josephine by Birdcatcher), described as "only a pony," produced Soult (1890, by St. Simon), "one of the ugliest sons of St. Simon," sold in 1896 for 115 guineas and imported into New Zealand by J.O. Hayward, who leased him to William Walters at Glenora Park, where he was five times leading sire, getting many high-class stayers and a huge number of brilliant horses that won at all distances. 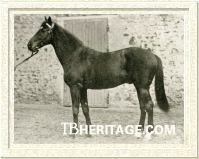 BEAHARNAIS was also third dam of Deutsches Derby winner Herold (1917, by Dark Ronald), twice leading sire in Germany. 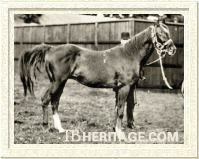 SAUCEBOAT (1878, from the Skirmisher mare Ravigote) became second dam of Irish Derby winner Bowline (1890, by Torpedo). SING SONG (1879, from Fragrance, by Voltigeur) was second dam of the speedy Golden Rod (1906, by Americus), twice winner of Goodwood's Stewards' Cup; Ascot Stakes winner Double Hackle, Cambridgeshire Stakes winners Wychwood Abbot and Kelling, and the wonderful turf mare April Run (1978, by Run the Gantlet) all descend in tail-female from SING-SONG. See-Saw, referred to in his own time as "the great miler," was, as his race record shows, able to extend himself to win up to a mile-and-a-half. While he got some horses that could win at a classic distance -- but no further -- most of his youngsters were milers or sprinters, yet, in the second generation, a number of good stayers, often with a good dose of speed, regularly popped up. Few displayed any hint of the beauty or height of their great-grandsire, Wild Dayrell, but even some of the least of them -- in height and accomplishments -- were, in the first or second generation, extremely influential in the development of the thoroughbred. ©1997 - 2009 Thoroughbred Heritage. All rights reserved.